Before 1500s to 1859 Indian tribes in the Round Top area were ﻿Tonkawa﻿ and ﻿Karankawa﻿. 1820s to 1840s The earliest Round Top area settlers were ﻿English﻿ who came to the area from other parts of the United States. 1821 With Mexico’s Independence from Spain the area of Texas is given to Mexico by Spain. 1826 Stephen Townsend and his family move to the Round Top area. The family established a Presbyterian Church, Florida Chapel, and founded a Masonic lodge. The Townsend family had the distinction of sending more men to the battle of San Jacinto than any other family. 1824-1828 Ten members of the ﻿Old 300﻿ received titles to land grants-a total of 92 land grants were eventually granted by the Mexican Government. 1830s The Ledbetter family land was the site of the first Round Top Academy. ​​At this time Round Top was known as the Townsend Settlement. 1833 Santa Anna was installed as President of Mexico. 1834 Stephen F. Austin was incarcerated in a Mexican jail for an act of sedition. 1835 Stephen F. Austin escapes Mexican jail. 1835 John Rice Jones, Jr. settled in the Round Top area in 1831 and in 1835 was made the first postmaster general of Texas by the provisional government. 1830s By the mid-1830s Round Top was identified as the Jones Post Office Settlement. 1836 Texas becomes an independent republic from Mexico. 1837 Fayette County is established. 1840s A house was built in the Round Top area, with an octagonal tower, which by 1847 was listed as a United States post office. The odd-shaped tower gave rise to the name Round Top. 1840s to 1860s German settlers and their traditions start to characterize the Round Top area. 1843 Nassau Farm/Plantation established by German Royals. The plantation site is located east of Round Top along FM 1457 at Wolff Road, with Historical Marker. 1845 U.S. President James Polk makes Texas the 28th state of the United States. 1850’s African American Slaves brought to Fayette County from the South to work on Plantations; which contributed to the growth and economic development of Fayette County. 1850 Round Top had a population of 150, two stores, two blacksmith shops, two taverns, a post office, and a line of﻿ tri-weekly stages﻿ serving the predominantly German citizenry. 1851 The first Czech immigrants started their journey to Texas, headed by Jozef Silar, attracted by rich farm land in Austin, Fayette, Lavaca and Washington Counties. 1851 Round Top has the distinction of having the oldest continuous July 4th Independence Day celebration west of the Mississippi. 1860 Fayette County Slave Population totaled 3,700. By 1870 the African American population totaled 5,901, and by 1900-1/3 of Fayette County’s population was African American. 1870 Round Top was incorporated and was one of the smallest incorporated communities in Texas. It is on the old La Bahía Road between La Grange and Brenham in Fayette County. After the civil war ended a group of transient Confederate “gorillas,” termed by the inhabitant as “rowdies,” made a camp in the cedar brakes surrounding Round Top. When they needed supplies, they terrified the citizenry by riding into town, shooting out all the window lights, and holding up the merchants in order to take what merchandise was needed. At last, the town turned out in body to elect a mayor, marshal, and town council. The mayor, appointed buglers to stand on guard, and as soon as the “rowdies” were seen riding into town the bugles were sounded and every man came to the town square, bringing with him arms. The “rowdies became less rowdy, and presently moved on. # 1. 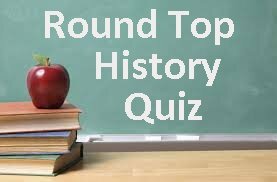 What year was the Round Top, Bethlehem Lutheran Church dedicated?